Injuries to the face, mouth, and teeth are common among children. We are here to help! Alligator Dental provides after hours emergency pediatric dental care and has Early Bird appointments to accommodate urgent care between the hours of 9:00 a.m. and 10:30 a.m. on regular operating days. Call us for more information! Click on the following links to learn how to care for each condition. If the fracture is superficial, it can be restored with cosmetic bonding. If the fracture extends to the pulp or nerve inside the tooth a baby root canal treatment or coronal pulpotomy is performed. This is a very simple procedure and not as extensive as a root canal treatment done on permanent teeth. If the fracture is below the gum line the tooth is removed and a spacer is placed to prevent drifting of teeth into the space and maintain space for the permanent tooth. This is caused by an infected tooth. The pulp or nerve inside the tooth is infected by decay. The abscess extends beyond the apex of the tooth into the surrounding bone, perforating the bone into the gum tissue causing a gum boil. The infected tooth cannot be saved. It has to be extracted to protect the permanent tooth bud from getting infected. The patient is first put on antibiotics and then the tooth is extracted. If your child is having a toothache, clean the area around the tooth. Rinse the mouth with warm salt water and use dental floss to remove any trapped food between the teeth. DO NOT place aspirin on the gums or tooth. This will cause a burn to the gum tissues. If there is swelling, apply cold to the outside of the face. Take acetaminophen or ibuprofen for pain. Call the dentist. Some patients get canker sores periodically.There is no definite cause for a cold sore.It could be due to stress, vitamin or zinc deficiency or it may have a viral origin.Cold sores usually last for 7 days.There is no definite treatment for cold sores.Treatment is aimed towards relieving the pain either with over the counter medication or prescription medication. We try to accommodate all emergencies on the same day. Please call early in the morning. If it is after working hours, please call our answering service and the doctor on call will call you as soon as possible. Please do not hesitate to call us if you have any questions. Your comfort is our priority! 1. Familiarity – Children become familiar with what happens in a dental visit such as exam, cleaning, and fluoride treatment. 2. Build Trust – Starting early helps build trust between child and dentist as the child learns what to expect from a dental visit. 3. Prevention – Prevention is key to a healthy mouth and happy child! The dentist can examine child’s mouth for decay, proper development, and any abnormalities. 4. Oral Hygiene – Establishing good oral hygiene habits early will provide a strong foundation for a growing child. At Alligator Dental our goal is to assist parents in establishing a foundation for their child’s healthy mouth – and to make going to the dentist A LOT MORE FUN! Click on the following links to see how to best care for your child’s teeth at each stage of development. The first tooth usually erupts between 6-9 months of age. However there is a wide range of tooth eruption and it is not unusual for a child to have delayed eruption of teeth. When your child is teething he or she will be restless, may drool, gums may be sensitive, may have a low-grade fever and diarrhea. Treatment can include – massaging sore gums with a finger or teething rings, placing ice or frozen rings on gum areas. The best remedy is your child’s pediatric dose of Tylenol or fever reducing medication for pain. Orajel type products may work for a short period of time, but are not recommended due to overuse. Proper oral hygiene should be instituted as early as when the first tooth comes into the mouth. Gums may be wiped clean with a damp wash cloth until teeth begin to erupt. At that point teeth and gums should be brushed with a soft bristled brush twice a day with a very thin smear of fluoride toothpaste. It is normal for the child to swallow the toothpaste at this age. Our doctors will demonstrate the proper amount during the child’s first visit. The brushing and toothpaste will remove plaque and begin also to strengthen the teeth as they mature. Plaque will form on any tooth and the gum pads around them causing potential inflammation and teething discomfort. Dental problems can begin very early. The primary cause of dental decay in young children is nursing or baby bottle tooth decay. A baby may get severe decay when he or she nurses constantly from the breast or a bottle containing milk or juice during bedtime or naps. A child should not be put to bed with a bottle of milk, juice, or sweetened liquid. If a bottle is used, only water should be used. A pacifier is preferable. It is recommended to stop bottle or breastfeeding by one year of age. Parents should brush their teeth twice a day with a very small amount of toothpaste. Toothpaste has quite a bit of fluoride in it. Use toothpaste sparingly in young children by using a very thin smear on the toothbrush. Let them brush, supervise them, and do the final brushing to make sure all surfaces of the teeth are cleaned. Also you need to floss their teeth as they get older as the posterior teeth get closer and tighter over time. Make sure they can rinse their mouth so toothpaste doesn’t get swallowed. Continue supervision until you are sure they can brush and floss properly. All Gators should see their dentist every six months for a routine visit. Your dentist may recommend the use of disclosing agents which help reveal the presence of plaque on teeth. Swishing with these agents before and after brushing will disclose the missed areas and motivate your child to improve their brushing technique. 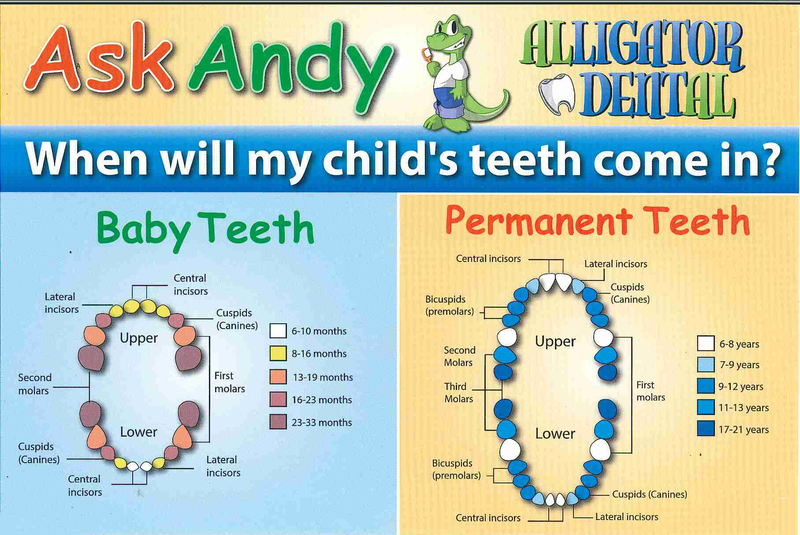 At Alligator Dental, we created this Tooth Care Handbook to provide parents with the best ways to care for their child’s teeth. Click on the following links for tips and tools to make your child’s mouth healthy and happy! Brushing 2x's a day keeps the cavity bugs away! All children need to brush their teeth at least two times a day: in the morning after breakfast & at night before bedtime. By disturbing and removing the plaque formation twice a day, parents can minimize or eliminate their child’s potential for tooth decay. For younger children: A parent should brush the teeth using a pea-sized amount of toothpaste. As the child gets older and you see they have the dexterity and patience to properly take care of their teeth, you may give over the task to them. But do periodically monitor their care. Toothpaste should be approved by the American Dental Association. Toothbrushes should be the proper size, small is better than bigger. Always use a soft nylon brush. Brush teeth in a circular manner. This will prevent toothbrush abrasion, excessive wear of the enamel at the gum line. A toothbrush should be replaced when it is worn with the bristles splayed, or after more serious colds, infection, Strep throat, etc. Floss only the teeth you want to keep! Flossing helps remove plaque buildup between teeth where the toothbrush bristles cannot reach. Use a gentle up and down motion to get between each tooth. Remember the old saying: Only floss the teeth you want to keep. Keep your enamel strong and bright! Sealants are the best anti-cavity invention! Sealants don’t take long to complete and can be added to your child’s regular checkup. Ask your doctor if sealants are right for your child! Primary molars also can benefit from the placement of sealants. The American Dental Association and Alligator Dental recommend scheduling a regular dental check up every 6 months. Baby teeth serve the important functions of eating, speech, and esthetics (self-image). These teeth not only help form the developing jaws, but they hold space for the permanent teeth so that your child will have a normal bite when the permanent teeth grow in. The last baby tooth falls out at about twelve years of age. A baby tooth can become so badly decayed that it can do damage to the permanent tooth. At times, severe infections of the face, head, and neck can be caused by infected baby teeth. Because of this, it is important to restore baby teeth as soon as decay is first detected. Teeth with dental decay can be restored either with amalgam (silver) or tooth-colored fillings. If the decay is extensive, it will require restoration with a crown. In the past, cavities could only be treated with unsightly metal fillings that are alloys of silver and mercury. These tooth fillings, especially when close to the front of the mouth, are highly noticeable and unaesthetic. Sometimes, the filling is so large that it causes discoloration of the entire tooth. These fillings, or restorations, often weaken teeth due to the large amount of the original tooth that has to be removed. Also, there is a risk of mercury poisoning from the alloy that is used in the tooth filling. Modern dentistry has increasingly turned to tooth-colored, or composite, fillings as a strong, safe, and more natural looking alternative. Composite fillings utilize a soft, white plastic substance that is hardened with a blue UV light. Parents can help us make the appointment for tooth restoration a successful and positive experience for their child. While talking to your child about the visit, use positive words like fun, easy, tooth asleep, silver star, water spray, etc. Do not use negative words like pain, hurt, needle, shot, tooth pulled, etc. The entire procedure will be explained to your child and you before the procedure is performed. Pediatric dentists are trained to deliver the local anesthetic painlessly. However, we do offer nitrous oxide and conscious sedation if the dentist sees the need for it. Once the procedure is completed, a piece of gauze referred to as “tooth pillow” is placed between the cheek and the teeth to prevent your child from accidentally biting into the numb cheek and lip. When the anesthesia is wearing off, your child will feel a tingling sensation which may be annoying to some children. Reaffirm to your child that the tooth is waking up. After treatment is completed you can help us to continue the positive experience by praising your child and referring to the "fun" time they had. Please avoid negative comments such as: Did it hurt? That wasn't so bad! You were so brave! Did you get a shot? Were you afraid? These comments could persuade your child in thinking there was a reason to be afraid, even though they were cooperative and had a good time. This may make their future visits more difficult. If you have any questions about restorative pediatric dentistry, contact our office. We specialize in kids’ dental care and oral hygiene, and we want to make your child’s experience as fun and carefree as possible!